Please note: The fee to write an exam at the Library in 2019 is $40. No exams will be scheduled on April 19, April 22 or May 20-24. 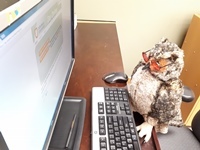 Dr. Whoot “tests” our exam computer! Exams will be administered according to the instructions provided by the school. If, for any reason, you require special accommodation, please clear it with your university/college first and ask them to notify us in advance. Some online exams require you to fill in your Student Number and Password. Please make sure you have access to this information. Please make sure you are prepared to write your exam on the date you have reserved. Except in the case of an emergency, there is no guarantee a request to reschedule will be accommodated. An ATM is located in the Civic Centre attached to the Library. Please remember, the Library is a public space as well as a place of business. You will be writing in a staff work area and though signs are posted and efforts are made by staff members to limit distractions, there is no guarantee that the environment will be completely free of noise.